U-SAVE Car & Truck Rental Franchise Disclosure Document for 2017 doesn’t paint a pretty picture of the struggling Ridgeland, Mississippi-based franchisor. Franchise and employee lawsuits, a 25% franchisee turnover rate and a working capital deficit of $12,374,676 are a few of the red flags that stand out. (UnhappyFranchisee.Com) U-Save Auto Rental has released its updated franchise disclosure document (fdd) for 2017. We’ve included some highlights (lowlights?) below. Trek Auto Sales, Inc, v. U-Save Auto Rental of America, Inc.* (U.S. Dist. Ct. for the District of New Jersey, Case No. 3:15-cv-08323-FLW-TJB). U-Save Auto Rental of America. Inc, v. RAC Enterprises L.L.C.. and David Rapier (U.S. Dist. Ct. for the S.D. of Miss., Civil Action No. 3:12CV464 WHM-LRA). U-Save Auto Rental of America. Inc, vs Sanford Miller (U.S. Dist. Ct. for the S.D. of Miss., Case No. 3:13-CV-127 HTW-LRA). Sanford Miller and Narcoossee Place LLC v. Macquarie Group Limited. Macquarie Capital (USA), Inc., MIHI. LLC. Boketo. LLC. Adreca Holdings Corp,. and Bruce Donaldson (In the Supreme Court of the State of New York, County of New York, Case No. 651 612/13, Filed 3 May 2013). Bob Barton v. U-Save Auto Rental of America, Inc.** AAA #69-166-57-14. According to Item 20 of the U-Save Auto Rental Franchise Disclosure Document (FDD), U-Save had a total of 123 franchises between 2014 and 2016. U-Save terminated 31 franchises during that time. U-Save had a 25% turnover of franchisees during that period. The U-Save domestic franchise count declined from 104 operating units at the start of 2014 to just 92 units at the end of 2016, a 16% decline. The Company’s future operations are dependent upon the Company’s ability to maintain profitable operations and FSNA’s ability to obtain additional capital to meet its cash flow needs. 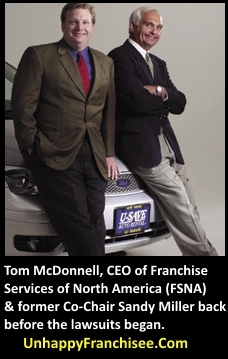 In addition, FSNA has a working capital deficit of $12,374,676 as of September 30, 2016 primarily associated with liabilities incurred in connection with its acquisition and reconsolidation of Simply Wheelz. Management believes the Company has sufficient capital to meets its obligations in the ordinary course of business through fiscal 2017, but may require additional capital in subsequent periods. There can be no assurance that FSNA or the Company will raise additional capital on favorable terms or at all. ARE YOU FAMILIAR WITH THE U-SAVE FRANCHISE OPPORTUNITY? SHARE A COMMENT BELOW. Gary Heavin on ABC Secret Millionaire: What do CURVES Franchisees Think? This franchise, in my opinion, has very little to offer. I have been told that the Usave franchisor shut down the reservation system on a West Coast licensee, over a dispute, that operates over 350 cars. Usave has shut off the flow of business to more than one licensee and in my opinion has violated the Franchise Practices Act. Buyer beware.